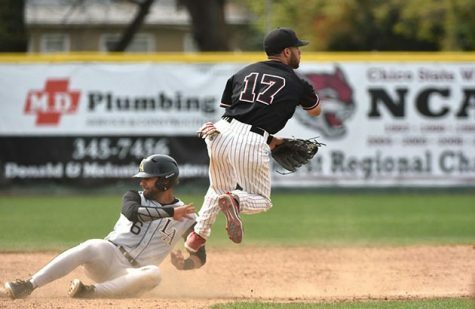 The Cal State LA men’s baseball team split a four-game California Collegiate Athletic Association (CCAA) series against the San Francisco State Golden Gators. 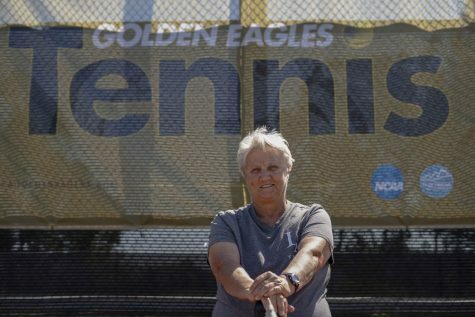 Despite settling with a split, the Golden Eagles were able to knock the Gators out of first place in the CCAA standings. Micah Hee got the start in the series opener for Cal State LA and picked up his team-leading fifth win. Hee pitched six strong innings and allowed only one earned run and struck out six batters on 99 pitches. Cal State LA broke open a 2-1 lead in the fourth inning as they tallied three runs. Catcher Noe Garcia drove in a run via sacrifice fly to centerfield, scoring third baseman Nate Alam. Right fielder Adam Gordon ripped a two-run double to right center to cap off the inning and extended the lead, 5-1. The home team pieced together four more runs to win the series opener, 9-3. It was a rough Saturday for the Golden Eagles, as they dropped both games of the doubleheader, 4-3 in the first game and 5-4 in the second game. Saxon Andross got the Game 1 start for Cal State LA, coming off a three-game winning streak. He delivered another quality start as he pitched seven innings, gave up three runs on seven hits and struck-out a season-high seven batters. Following a solo-jack to Gators’ center fielder Jack Harris, Andross settled down and threw five shutdown innings. He ran into trouble in the seventh-inning and gave up two more runs. The Golden Eagles’ eighth inning surge was not enough to mount a comeback as they fell one run short. After a sacrifice fly off the bat of designated hitter Spencer Sundahl and an RBI single from first baseman Alec Daily, center fielder Jordan Myrow grounded out to end the threat. Nick Moisant took the mound in the seven-inning nightcap and struggled early on. He allowed the first four batters to reach and gave up a two-run home run in the first inning to Gators’ first baseman Harley Lopez. Moisant pitched five innings and allowed four runs on five hits in five innings. The Golden Eagles got on the board in fourth behind second baseman Jordan Peabody’s run-scoring single to cut the lead, 2-1. This did not stop the Gators’ offense, as they added two more runs in the fifth and one more in the seventh to take a commanding 5-1 lead. The Golden Eagles would not go down without a fight, as they began to rally back in the seventh. Gordon picked up a two-run triple and came in to score after Myrow drove him in with an RBI single to cut down the lead 5-4. But that was the final time the Golden Eagles scored, as the Gators hung on for a doubleheader sweep. In the series finale, the “Black and Gold’’ crew offense exploded for 14 runs on 14 hits, as they routed the Gators, 14-3. This was also the Golden Eagles’ inaugural Veterans Appreciation Game and featured Cal State LA military veterans, service members and their families. 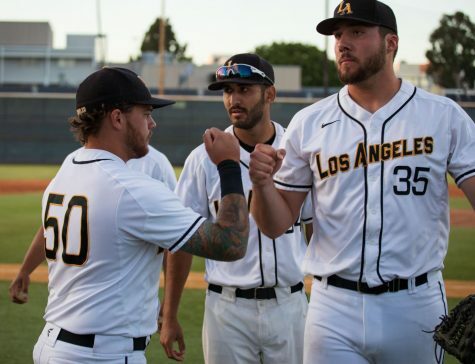 Alec Daily started for Cal State LA and pitched seven innings and allowed three runs (two earned) on six hits. He also struck a season-high 10 batters as he improved to 3-2 this season. 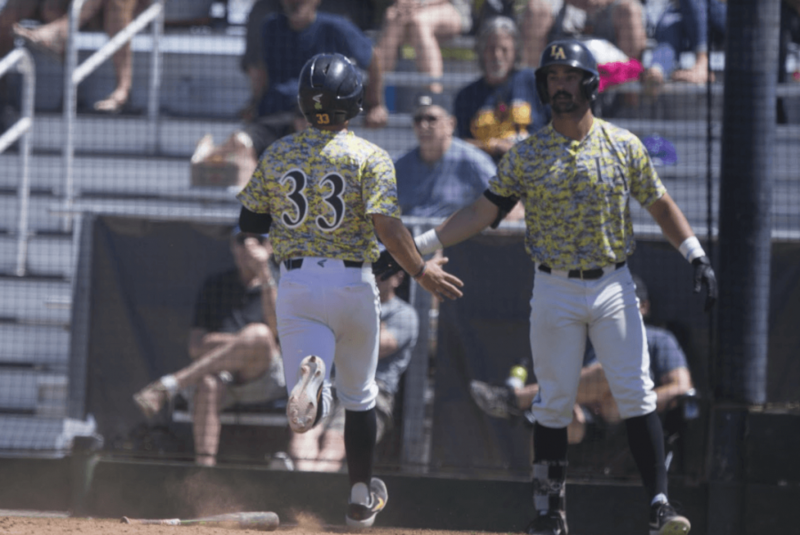 The game was tied 3-3 going into the bottom of the sixth, before the Golden Eagles scored 11 unanswered runs (six in the sixth and five in the seventh). 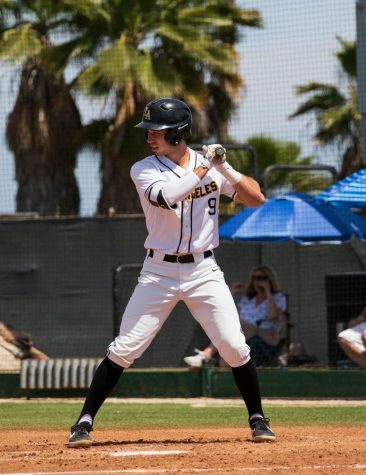 Shortstop Tyler Odekirk picked up three hits and scored three runs for Cal State LA. His teammates, Myrow, Garcia and Alam each had two hits, while Gordon went 2-for-4 with three runs batted in (RBI). After the series, the Golden Eagles overall record is now 14-15, while their CCAA record is 13-12. 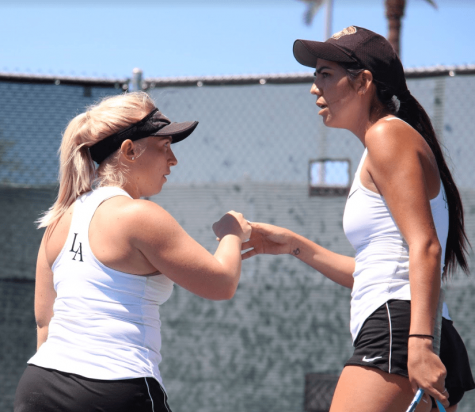 They are currently in a three-way tie for fifth place in the conference along with the Chico State Wildcats and the Sonoma State Seawolves. 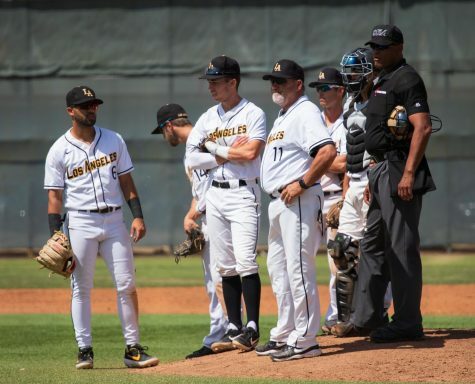 Speaking of Sonoma State, the “Boys in Gold” will begin a four-game road series against the Seawolves at the Seawolf Diamond in Rohnert Park on April 5.